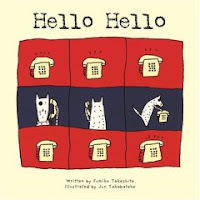 Hello, Hello by Fumiko Takeshita, illustrated by Jun Takabatake. Kane/Miller; copy donated by publisher. Originally published in Japan in 2000. The Plot: How to use the telephone. The Good: Seriously. A book about the telephone. You have no idea how many parents and preschool teachers want simple books like this about basic things for their young children. And how difficult it is to find! This isn't all techy about phones. Three sentences explains the invention: "It used to be, we could only speak face to face. Later on, we could write letters. But now, we have telephones. 'Hello, hello!' It's fast and easy."